I’ve talked about how the canning jars seem to multiply before my eyes. Every time I blink, there’s more of them. This is in addition to the jars that have already fulfilled their destiny as a vessel for homecooked goodness. As much as I enjoy canning, there’s only so much I can do and only so many jars that I can give away. Besides, the idea of consuming even a wee jar of fruit jam or butter all by myself in a single sitting is kind of gluttonous and gives me a stomach ache. These empty jars force me to get creative. And by creative, I mean scour google for other people’s ideas. 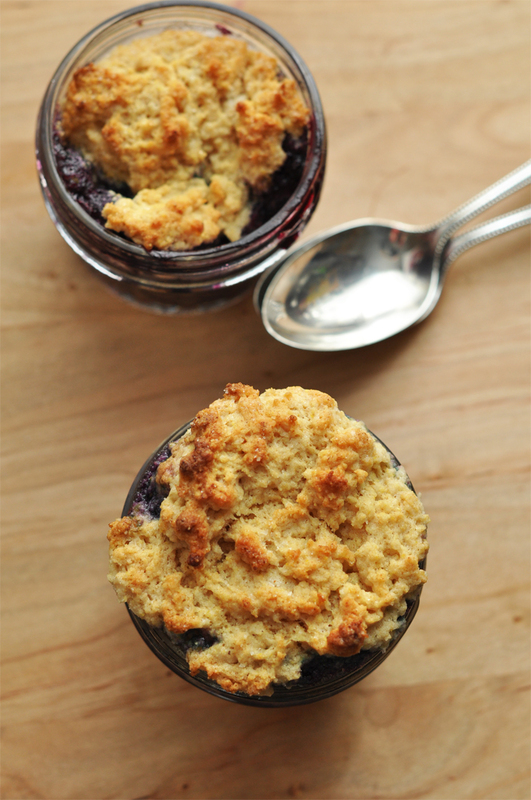 That’s how I stumbled across blueberry cobbler in jars. It was a perfect storm. The Mistah and I had just come home with a bounty of fresh picked local blueberries. There was a stash of empty jars begging for attention. And we had promised to bring dessert to an outing with friends. Unlike the Hollywood blockbuster of the same name, this perfect storm had a happy ending. Blueberry cobbler in jars provided the perfectly portioned dessert for our outing. It also won the hearts of the folks at the coffee shop when I showed up with wee jars of cobbler for everyone. Because really, how bad can a Monday morning be when you start it off with a few bites of spiced blueberries and baked topping? BAH Note: I was hesitant about adding the cornmeal to the biscuit topping. I almost didn’t do it. Fortunately I ended up grabbing the container of cornmeal out of the pantry and scooping out a few tablespoons…it made the topping I sampled out of the bowl snap, crackle, and pop. It felt like the combination of cornmeal, buttermilk, and baking soda/powder tag teamed to form an effervescent tingle in my mouth. So do I think it’s worth buying a container of cornmeal for the topping? Hells yes. And if you need another use for that cornmeal, check out the creamiest polenta you’ll ever eat. Wash and dry 12 half quarter pint (4 ounce jars) and place them on a baking sheet covered in aluminum foil. Combine the first four ingredients in a large bowl. Add the berries and gently stir until they are combined with the sugar mixture. Stir in the lemon juice and zest and divide the filling among the 12 jars. Bake for 25 to 30 minutes or until the filling is bubbling and hot. While the filling is cooking, whisk together the flour, cornmeal, baking powder, baking soda, salt, sugar, and cinnamon in a bowl. In a separate bowl, combine the melted butter, buttermilk, and vanilla. Remove the pan of jars from the oven and IMMEDIATELY TURN THE OVEN TEMPERATURE UP TO 425 DEGREES. Pour the buttermilk mixture into the cornmeal mixture and stir until they are just combined and no dry streaks remain. Divide the topping among the jars, gently and CAREFULLY pressing the dough down onto the bubbling filling. Return the pan to the oven and bake for another 15 or 20 minutes until the topping is cooked through and golden brown and the filling is gently bubbling around it. Cool on a wire rack for about 20 minutes before serving or allow the jars to cool completely before screwing on clean bands and lids for longer storage in the refrigerator. Okay, now I really want cobbler! Beth, it’s too early for fresh picked blueberries but you could certainly use grocery store berries.� You know, to whet your appetite for when blueberry season rolls around. Aww, man, it is a long wait till fresh blueberry season. I love this idea though. And the cornmeal also works like little ball bearings to move your pizza or homemade bread from your pizza peel to the oven. Jennifer, these cobblers taught me the importance of picking a boatload of berries to keep some stashed in the freezer…if my freezer could hold more than ice cubes that is. Those look fantastic. yay for creative uses of jars! Elizabeth, it’s an ongoing challenge to use my jars.� I love that this tasted delicious and got some of the jars off the shelf. amazing. anything cooked mini and/or in jars is a win. You know I won’t argue with that statement Lan.� I used the berries our fellas picked to make these beauties. These are so cute! I’d love to dig in to one. They seem great to serve at a party. I’m a crisp girl, not a cobbler girl, but those are really dang cute. Well you know, you could totally turn this into a crisp.� Just substitute your favorite crisp topping combination for my cobbler topping.� Et, viola, cris de bleuets. Just a small correction; 1/2 pint jars are 8 oz., 1/4 pint jars are 4oz. I am all for an 8 oz jar of your delicious recipe. Oh dear, you are absolutely right. 4 oz. is a quarter pint. Evidently WendiMath and real Math are not the same. Can these little jars be put in freezer? I haven’t tried freezing these. Mostly because they don’t hang around long enough to need extended storage. You could probably bake the filling for 20 minutes, cool the jar completely in the fridge, add the biscuit topping, and freeze. When you go to serve, bake an additional 5 to 10 minutes. I may have to try this myself because I have a ton of blueberries in my fridge right now that need to get used up. Thanks for the inspiration.